This week we dive at a very accessible dive site that many families will really learn to enjoy in the summer. Maeda Flats is an open expanse of reef that is not too far from the Ramada Renassance Hotel and very easy to find. Here you will be able to take the kids and go reef waling in between dives. It is also a great place to bring your kayak and put in. On an incoming tide you will scoot out across acres of hard corals. Enjoy the view but get there early in the summer because parking can be at a premium. Level of difficulty: Novice to expert. Site Location: Drive north on highway 58 past Kadena Circle and continue to the village of Yamada. The Ramada Renaissance Hotel is on the left side of Highway 58. Turn left at the traffic light in front of the Ramada. Take this street, Highway 6, driving up the hill passing through one traffic light. Just past this traffic light, about 1 kilometer you will see a road sign pointing right to Maeda Misaki. Turn right here and continue as if driving to Maeda point but stop at the last street on your left just before the entrance into Maeda Point's parking lot. Turn left here on to the improved, paved, road and proceed down the winding road through the cane filed until you reach a small dirt road on your right. Turn down that road. On a busy day (weekend) you will see cars parked at the end of that crushed coral road. On weekdays, or early any morning, you can go all the way down and park in front or, or near the concrete filled bamboo posts at the top of the walking path to the beach. 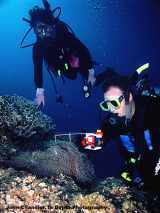 What to expect: Probably the most accessible sport diving on Southern Okinawa. This dive site has a large flat coral apron that divers must overcome to get to the reef, but IT IS WORTH IT! In summer months divers and snorkelers should be sure to hydrate often and do not drink alcohol while having fun in the water. The heat in summer, even while you are in the water, can still dehydrate you and ruin your fun. So bring a six pack of water. I strongly recommend you consult your dive tables with some seriousness here. You should not dive this on an outgoing tide since the water drawn across the long flat reef could impede your abilty to swim in against the outgoing tide. It is, however the flats are a great dive at low tide, or on an incoming tide when there is no wave action across the reef. Be sure to bring the kids along too because the snorkeling here is magnificent. I always bring a dive tube along and let the non-divers hang on to it and enjoy the view from the safety of the float. Recommended 1st Dive Profile: Down the path and out across the reef following a due north heading. There is a cut in the center of the reef between the two large, and exposed coral formations. Again, this is due north from where you entered the beach from the parking area. Follow this cut as it descends across lovely corals filled with clown fish, anemone, and swirling schools of butterfly and larger bat fish. Dive down this cut in a northerly direction until to reach the edge of the reef and then turn into the direction of the prevailing current. This will allow you have an easy return in a following current when you are lowest on air toward the end of your dive. Maeda Flats has been a favorite to night divers for many years due to the abundance of shells and lobster that come out of there rocky habitat and move around at night. Also, you will find wonderful opportunities to practice your Underwater Photography skills by taking pictures of your buddies, the amazing reef, and the surrounding aquatic animals. Other activities: A solid location to employ the use of the plastic fish and coral slates you can by at all local dive shops. You can dive all day identifying new and unusual fish. Should you find some fish not on the slates just make up a name that suits the fish or animal. You will better remember the creature and this will help a lot when you make your way to the library to really identify your discovery. This is also a great place for kayakers to put in and then paddle around the point and enjoy the beauty of Maeda Misaki. See you at the flats!